Amazing love this place feels like home from home. This was our 4th visit carnt wait until our next stay. The only reason we put good for comfort is because the bed and pillows are too hard for us but hay this is been picky and as I have pointed out we have already booked our 5th visit. I would highly recommend the cart shed to anyone an we do. Thank you for your lovely review. We are glad you enjoyed another stay here at The Old Cartshed and look forward to welcoming you back again! See you soon! This has been the best equipped and comfortable cottage we have stayed in, in the 4 years we have been staying in Northumbria, great doggie gift bag and bowels and towels supplied for dogs, only little downside is the small courtyard for the dogs but the beautiful beach is close by. Thank you for your fantastic 5 star review! We are glad you enjoyed your stay and you found the cottage comfortable and well equipped! The K9 welcome pack is a new addition and we are thrilled your furry friends enjoyed it! We hope to welcome you back in the future. 13th stay at the Cartshed, pretty much says it all. We really enjoy the peace, tanquillity and location. We are close to where we like to be with very short car journeys to spread our wings a bit further. If we want a lazy day, the Cartshed has all the amenities we want. The small, enclosed and gated back yard, means our new dog, Logan, can wander in and out safely, and as this appears to face southerly, it is bit of a suntrap for us to sit out. This place suits us down to the ground. Thank you for your fantastic review! It was lovely to have you stay at Cartshed again and we are glad you have found it has comfortable as ever. We look forward to your next visit! This was our first stay at The Old Cart Shed and we weren't disappointed. The property was just perfect - everything had been thought of, from the provision of dishwasher and laundry tablets to the toiletries in the bathrooms and lots of towels. The property was warm when we arrived on a cold February afternoon and although there was a small log burning stove we only used it once as we just didn't need it. Notwithstanding, there was a massive basket of logs and some kindling if we had. The location was perfect. The property isn't in the middle of nowhere and it isn't quite clear from the photographs but there are properties to each side and opposite. However, the Cart Shed isn't overlooked or attached so it was perfectly quiet save for the odd car on the road outside. There was ample parking for two cars and bins right next to the parking area. All the lights outside worked and there were very detailed descriptions of how everything worked in a folder inside the property. From reading the visitors book it is clear that lots of people return here year after year and I can see why. Marvellous! WOW! Thank you for your FANTASTIC 5* review! We are thrilled you enjoyed your stay at The Cartshed - it is in a fantastic part of Northumberland. 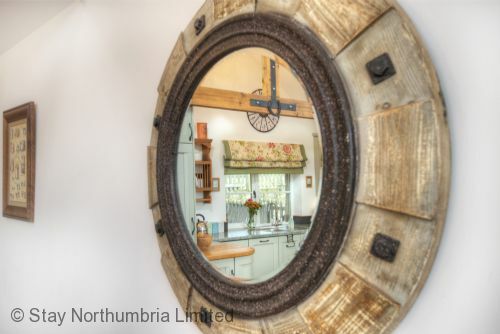 Close enough to all attractions but away from the main business of the village centre - the exact reason Stay Northumbria HQ is a few doors down! We hope you plan on making a return visit in the near future! We’ve stayed a number of times now and keep going back....because there is nothing to fault the property!! Thank you for submitting a review of your stay at The Old Cartshed. We will pass your comments onto the Owners who are proud of their rustic and cosy property on the outskirts of Seahouses. had an excellent holiday away form the fireworks for Guy Fawks, can honestly stay that the standards of accommodation are first class one of the best self catering units we have stayed in. very impressed with the amount of utensils supplied the attention to detail was very impressive, the best i have encountered, every thing catered for. Thank you for your fantastic 5* review! We are glad you enjoyed your stay at The Cartshed and found it to be top class! We hope to welcome you back in the future. I am now losing count of the times we have stayed at the "Cartshed". For us, the location is perfect, being a reasonable walk away from the beach, which allows the dogs to dry off before we get back. It is a central location whic means that nothing is too far away. Morpeth and Anwick are available for bigger supermarkets and shops, Holy Island is within easy range and all the wonderful beaches from bamburgh to Amble are also within easy car range. The cottage itself is comfortable, warm and well appointed. The southerly facing aspect of the courtyard at the rear makes it ideal for sitting out and the dogs are safe to wander in and out. All in all, a wonderful cottage. Thank you for your fantastic review! We are glad you enjoyed another stay at the Cartshed and look forward to welcoming you back again in 2019! The Cartshed was excellent. It was very clean and the facilities were everything we could have wanted. The welcome packs for both us humans and the dogs were well thought out and useful. The location as advertised, was very close to St Aiden’s beach, three minutes in the car or a 30 min walk and the surrounding area was very quiet and peaceful. Seahouses and the boat trips to the Farne Islands is a very short drive away and the car parks are free for the first hour so easy to pop in for a bit of shopping. 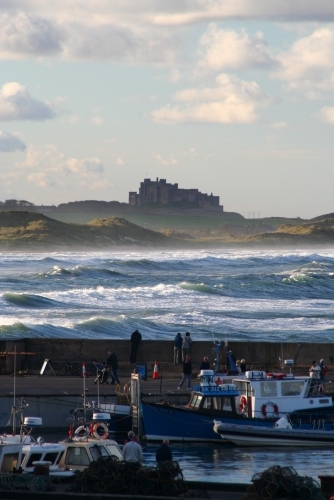 Walking to Bamburgh can be done from the house and Lindisfarne can be reached in a short time. The information pack in the Cartshed is one of the best we have seen. It covered every question and was easy to reference. It even gave the tide times for the causeway to Lindisfarne. Also,the aspect of the Cartshed with its large west facing windows sheltered by a courtyard wall made the house feel very warm and cosy. The sunrise from St Aiden’s beach is well worth the early rise. We would certainly like to return - it felt like a home from home. Thank you for your fantastic 5* review! We are glad you enjoyed your break at the Cartshed and found it a home from home! We hope to welcome you back in the new year. An excellently presented "cottage". The Cartshed is a very welcoming holiday home from the moment you park up. It is well presented and well appointed. It is warm and cosy, with nice decor, the underfloor heating being a great boost ensuring a constant temperature throughout. It was also nice to have access to ventilation when required through the electric Velux windows and other windows. Being on one level it is well suited to less mobile people with the It is situated near to Sea Houses where you can secure most things in clean pleasant shops. There is a wealth to see within a relatively short distance. The real test of any holiday home is would you we revisit- "we plan to...". Northumberland cottages staff are also very helpful and thoughtful. Carrtshed was a very comfortable/clean and well stocked holiday stay. Many thanks for submitting a review of your stay at the Cartshed. We are glad you enjoyed your stay and hope to welcome you back in the future. The Old Cartshed is perfect for fabulous dog walks along the beautiful Northumberland beaches plus fantastic visits to the Farne Islands - perfect time of year and some excellent restaurants nearby . What another comfortable stay at the Old Cart Shed, exactly 12 months on from the last one. The three of us had a fantastic week, shame the clouds never lifted from Tuesday onwards. The Cottage was comfortable as ever and in a perfect quiet location with just a 20 minute walk into Seahouses, using the old Railway Line. My son also loved watching the cheeky Chicken coming into the garden for food. We feel that Howick Hall Gardens is a must see, the gardens are lovely and bigger than what we thought. Also The Ship at Low Newton is good visit for a cheeky pint or two and the food looked lovely too. Thank you for your lovely review! We are glad you enjoyed another stay at The Old Cartshed. The location is ideal for those who enjoy the peace and quiet of the countryside while still being close to village amenities. We hope to welcome you back in the future. It's a nice place, all the décor and fixtures are in great condition. The location is pleasant and rural, about a mile to the beach down a quiet lane. No complaints. Thank you for submitting a review of your stay at The Cartshed. We are glad you enjoyed your stay. This was our third stay at The Old Cartshed, it’s beginning to feel like a second home! A great deal of thought has gone into making the cottage work as a holiday home, everything you need is there. And, if it isn’t, you just pop next door to the office and the lovely staff make it happen. Nothing is too much bother. We, and our two dogs love it. From the lovely welcome pack left for us and the dogs, the cleanliness and quality of both indoor and outdoor spaces and the proximity to beaches and to Seahouses, it really is a great place to stay. Thank for your your amazing 5* review! We are glad you enjoyed another stay at The Old Cartshed and look forward to welcoming you back in the future. Thank you for this glorious review and recommendation. We are delighted you enjoyed your first visit to Northumberland and your stay in The Cartshed and appreciated all it has to offer. We would love to welcome you back to Northumberland for a second visit in the future. Facilities are excellent and although the weather was very cold this stay, it did not stop us in the least. the location is perfect for us, We actually got to use the log burner this stay. We have booked again already, which I feel says enough. We love the Cartshed and feel it is perfect place to stay in this wonderful area. Thank you for your 5* review of The Old Cartshed. We are glad you enjoyed your stay (and the use of the log burner!) and look forward to welcoming you back in September! Thanks again. We stayed at the Old Cartshed a year ago which was the first time we’d visited Northumberland and decided to go back on account of the accommodation we’d enjoyed so much. Whilst we didn’t get the good weather we had last time, being snowed in made for a relaxing week! The accommodation was every bit as good as previously, it’s clean, well appointed and most importantly warm. The bitter cold, snow and wind had no impact on the inside. The owners were helpful and understanding when we were faced with the possibility of needing to stay another day although in the end we were able to leave on time. Would still highly recommend this property and it’s owners. Many thanks for your review! We are glad you enjoyed the comfort and warmth of the Old Curtsied when the "Beast from the East" decided to hit the Northumberland Coast! We hope you plan on returning in the future, hopefully for some sunshine next time! Beautiful, comfortable and grand location. October visit and the weather was great ! Great location , main purpose of or holiday was to do lots of walking .. bamburgh beach is our favourite. Thank you for your fantastic 5* review! We are glad you enjoyed an autumnal break at the Cartshed. Please do not hesitate to get in touch regarding a future booking! 3) the property is clean when we arrive, and we settle in very quickly. 4) it is a short walk to and from the beach or Seahouses. 5) the beach at Bamburgh is spectacular, very rarely crowded and our dog loves the dunes and the sea. For us it is perfect, we love it. Thank you for an amazing 5* review! We are thrilled you enjoyed yet another stay with us in Northumberland and look forward to welcoming you back in the New Year. Thanks again for the high recommendation. This is our first stay at the old cart shed and won't be our last. It is the first time ever I have stayed at a holiday cottage and couldn't find anything that was wrong with it, it's perfect. The owners have thought of everything you could possibly need. The decor is lovely and everywhere was spotless. First class. Thank you so much for your glowing review! 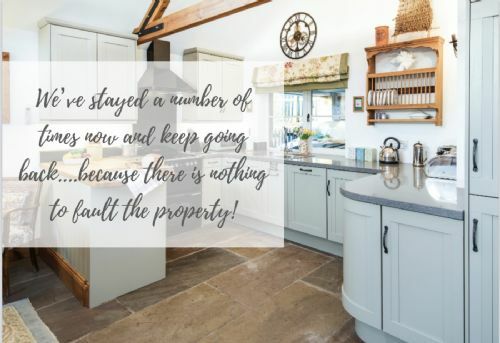 Cartshed is a fantastic property and we are so glad you loved it! We hope you had an amazing time here and hope to see hear from you again regarding another break in North Northumberland. Carthouse is a beautiful cottage , lot bigger than I thought it would be , well stocked , owners left a large box of boarder cookies , which were enjoyed very much , will go again . Pleased to hear you enjoyed your stay in the Cartshed and we welcome you back again for another visit. Third time we have stayed at The Old Cartshed and if anything it has got better. Nice touches with the K9 welcome pack and goodies for humans! Thank you for yet another great review. We look forward to welcoming you back again in the future. We stayed at the Cartshed in May and we were blessed with the hottest week so far this week. The Cottage was lovely and with having a two year old, having everything on one level really helped. There was everything we needed and also we got to watch lambs jumping and playing in the field over the wall and the cheeky chickens coming to say hello. It's an easy walk into Seahouses, as at the end of road there is the old railway track to walk down and brings you out into the car park in the centre. One thing you must do, is visit the Ice Cream Shop in Bamburgh, it is worth every penny! If people do take little ones, just be aware of the speed some vehicles drive pass! Only one bad thing and with us not having a dog, we had to vac the carpet before we let our son play on it, as it was covered in dog hairs. We will be back for a second visit sometime soon. Many thanks for your review of your recent stay at The Cartshed. We are pleased that you enjoyed your stay and we do apologise about the dog hairs on the rug in the lounge. The owner is going to get the rug cleaned as soon as possible. Many thanks for your review. We are really pleased that you enjoyed your stay & that you had everything you needed. We very much look forward to welcoming back in the future. The Cartshed is great for two couples or a family with one or two children as the sleeping arrangements have flexibility. Good size beds, single or double, in comfortable en-suited bedrooms. The Cartshed is all on one level with a good sized lounge/dining/kitchen with glazed doors out onto the sunny courtyard garden. As holiday accommodation this is a superb social space and is very well equipped whether you want to buy in your meals or create them in the kitchen. Parking is an integral car port and it's so easy to unload and load you car from the property, although you need to be confident drivers if either car is large. Location is great being between Bamburgh and Seahouses in a quiet spot, although beware of the usual quiet country lanes danger of fast drivers coming from nowhere! It's an easy 20 minute walk into Seahouses using the lane and old railway line and equally easy 20 minutes to the magnificent beaches beyond the dunes - paradise for humans (and dogs, all year!. Highly recommended. Many thanks for your lovely review of your stay at The Cartshed - we are delighted that you enjoyed both the cottage and its location. Simple 20 min walk into Seahouses and from there straight out onto a sublime coastline - just perfect for our two four legged friends (who were very appreciative of their welcome pack!). Many thanks for the great review and delighted you all had an excellent stay. We would love to welcome you back to the Cartshed in the future. Just returned from our 4th trip in two years to The Cartshed at Seahouses. We absolutely love it there as do our Beagles!! Excellently appointed clean Cody open plan cottage even got a Krups coffee machine!! Very relaxing in countryside environment with small enclosed courtyard garden overlooking fields! Short drive to beaches and ideally situated for trips to Bamburgh , Beadnell Craster and Holy Island. It now feels like our 2nd home have already booked our 5th trip need I say more!!! Many thanks for another lovely review of The Cartshed - we look forward to seeing you again later this year! My wife and I took our dogs for a week and found The Old Cartshed to be a beautifully restored building of a high standard that provided a very comfortable home for our holiday. It is in a quiet location a walkable distance to the beach and the nearby town of Seahouses. The owners are incredibly helpful without being intrusive. The comments of many happy holidaymakers in the visitors book suggest that we aren't alone in our desire to return. Thank you for wonderful review, the owners and the team at Stay Northumbria strive to make guests enjoy their stay. We look forward to welcoming you back to the Cartshed in the future. This is our second new year stay at the old cart shed, we are booked for a third visit as the property is exceptionally comfortable and cosy with everything you need for a relaxing stay. The staff at stay Northumbria are professional friendly and extremely helpful with a nothing is a bother attitude. The cottage is in an idea quiet location yet within walking distance of the beach and Seahouses and Bamburgh. Each have plenty options for dining out or popping in for a refreshment after a long walk. Happy New Year to you also! Thank you for the lovely review and the lovely comments about the Stay Northumbria team. We are delighted that you enjoyed your stay once again and we look forward to welcoming you back to The Cartshed for next New Year. This beautiful cottage is ideally placed if you want to be away from it all, and yet close enough to amenties. The Cottage is of a high standard - a real home from home. Each bedroom has a TV insitu - so plenty of entertainment!! The only very minor critisim for us was the fact there was only a samll court yard that wasn't grassed - having a dog that will only use grass proved a minor problem, but only 1/2 a mile away is a small walk through a wooded area, so if you have a dog and dont mind going there first thing in the morning - you shouldn't have a problem. A real Gem of a cottage - we have already booked it again for next year. Delighted that you have booked to return to the Cartshed next year, repeat bookings are the best recommendation! There are lots of walks and grassy areas around the cottage for our 4 legged friends. The Old Cartshed is a perfect mix of comfort and rustic charm. It is perfect for 2+ dog or would be easily suitable for two couples. It is very well equipped to prepare meals, I think the only thing we couldn't find was a cheese grater, but it was literally the only thing. The location is convenient, within walking distance of Seahouses, though if you want your fish and chips warm it might be best to take the car. 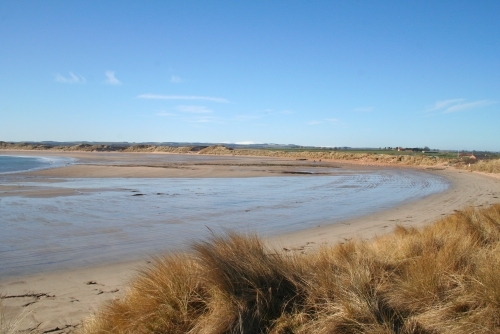 It is easily possible to walk to the beach and then up to Bamburgh and back. All in all a very nice comfortable stay and we will hopefully return soon. We are pleased that you enjoyed your stay at The Cartshed, the facilities of the cottage and the local area. fab base for walking, beaches in every direction, so we all loved it. Seahouses is such a happy place, with lovely people, children playing on the beaches, and friendly dogs. the cartshed was a gorgeous base, with a big tv, so after a days walk we were able to catch up on box sets in comfort! Many thanks for your feedback on your recent stay at The Cartshed. We are pleased that you enjoyed the cottage as a base and loved our local area. 2nd visit and still great! Perfect location for exploring this part of Northumbria and Scottish Borders. Very peaceful and suits us perfectly with the dogs and the Stay Northumbria folk are always helpful. We will be back in the future. Only dropped the rating for "Condition" to Good as the main rug in Lounge is getting tired and 2-3 pieces of the furniture also....BUT. Tiny, Tiny observations only because the standard is so high. Lovely cottage situated ideally for Northumbrian coast, easy to walk into Seahouses where you can purchase almost all you need. The Old Cartshed is a superb rebuilding of an old building with off-road parking for two cars, beautifully decorated inside with all the facilitates you would need for a wonderful break. Nearby Bamburgh and Beadnell have fabulous beachs for you dog and also excellent dog friendly pubs serving good food and ales. This is a property to which we will certainly be returning in the future!! Many thanks for your review. We are pleased that you enjoyed your stay at The Old Cartshed & very much look forward to welcoming you back in the future. We booked for ourselves and my elderly (late 90s) mother - and our dog. This property was ideal to bring an elderly relative - all on one level, including the entrance and courtyard garden, two en-suite bedrooms and even flooring. To help us, we were given an extra chair which was a little taller and with arms for easier use by my mother - this was a really helpful action. Furnishings, condition and decor are excellent. The "barn" is light and airy and is very well equipped. Everything was clean and in good working order. Location great - peaceful yet an easy 20/30 minute walk to Seahouses for shops, restaurants etc and in the other direction just 15 minutes to vast sandy beaches, dog friendly all year. Many thanks for your lovely review. We were more than happy to put an additional chair in for your elderly mother & are pleased it was of use to her. We very much look forward to welcoming you all back in the very near future. We thoroughly enjoyed our visit to The Cartshed. The kitchen was excellently equipped, everything we needed was to hand and China, glass, cutlery etc were very good quality and plentiful too. The beds were also very comfortable and the living areas always comfortably warm. The dishwasher could have performed a little better but this may be due to the type of tablets provided. Thank you for the review and the positive comments about the Cartshed. Sorry you were disappointed with the dishwasher tablets we provided, we only use Eco friendly products. Had a great week staying with a friend at The Cartshed @ Westfield. On arrival, we were most impressed by the property which is spacious and very well equipped to a high standard. We each had a double room with a bathroom. The property is in an extremely quiet location, situated about a mile or so outside Seahouses but it is an easy walk, partly along a disused railway. We did have a couple of problems. The doors to the patio would not lock one morning when we were planning to go out so I phoned the out-of-hours number as it was Sunday. Fortunately, we managed to sort it ourselves and were then able to secure the property so we rang back to say that it was now OK. However, the following morning, someone called to check that everything was OK though not in response to our call. When we mentioned the problem with the door the previous day, he sent someone else to see us who then called out a joiner who came to have a look at it. This all took place within a few minutes! We also mentioned that the kettle was making a strange noise although it was working and the toaster was also working but did not pop-up. The following day, we came back to find both the kettle and toaster had been replaced by new items. We thought that this service was second-to-none. The weather was not brilliant but fine most days although quite cool. We enjoyed sitting out on the small patio which is quite a sun trap. We went on a couple of boat trips to the Farne Islands and caught the bus to Berwick one day. All in all, we had an excellent week and would thoroughly recommend The Cartshed and also Stay Northumbria. The Cartshed remains a beautiful place to stay, ideally located out of Seahouses and close to Bamburgh. The facilities and Customer Services are excellent. It has always been clean and tidy, and although it takes dogs, does not appear to suffer from them.We have a black labrador ourselves and he loves it there as well. Local facilities are excellent, and National Trust properties at "Cragside" and "Wallington" are not that far away. We all thoroughly enjoyed our stay, so much so, we have booked again for later in the year. That will be our seventh visit. Having hired a number of properties in this area over the years I can thoroughly recommend the Cartshed as a great compromise of country location with easy access to all local facilities. Everything was first class!!!! We loved this cottage. It had character, comfort, cleanliness and was very well equipped. We felt very welcome, through the process of booking up to and including arrival, with a little welcome pack for us (and our labrador!) after our long journey. The location, whilst slightly out of the nearest village, suited us very well. 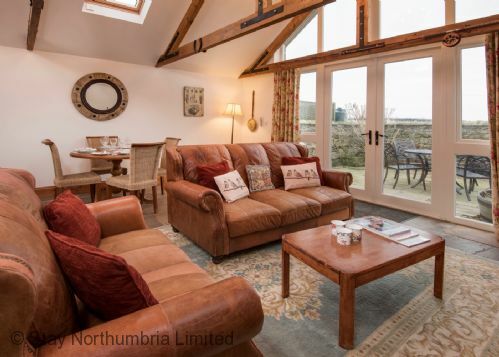 Set in a lovely farming landscape, we found it to be a perfect quiet base from which to explore the surrounding and beautiful Northumbrian countryside and attractions - the beaches near this area are outstanding. Overall, we can't fault it and would certainly pay a return visit. I was recommended to stay at the cartshed by two work colleagues as I bought a dog last year & needed a dog friendly cottage. I wasn't disappointed. It has a lovely feel about the place as soon as you walk in. We stayed over Easter and were greeted with an Easter egg and weather report for the local area, a really nice touch especially when you've had a long drive. Located about 15-20 minutes walk from the beach (3 minutes drive)& an enclosed outside area with table and chairs perfect for al fresco dining. The only possible downside was the internet access wasn't great but when you're on holiday this can also be a positive!! Would love to return very soon but booked up ( not surprisingly) Would definitely recommend to all ages. I'm 44 & went with my mum & 9 year old who loved it too! Yet another fabulous stay at The Cartshed. Beaches were wonderful, great walks with the dogs. Some wonderful meals, plenty to choose from. Looking forward to another stay later in the year. We spent a week at the Cartshed in Feb/March 2016. From the moment we unlocked the door and looked inside we knew we had found somewhere exceptional. A really outstanding 'home from home'. The quality of everything provided was amazing and 'everything' was provided, we wanted for nothing. The 'welcome' packs for both humans and dogs were a really lovely touch too. A quiet location, with a great walk to the beach, a round trip of about three miles was our regular doggie walk twice a day and it was absolutely wonderful. The beaches are fabulous as are the views. 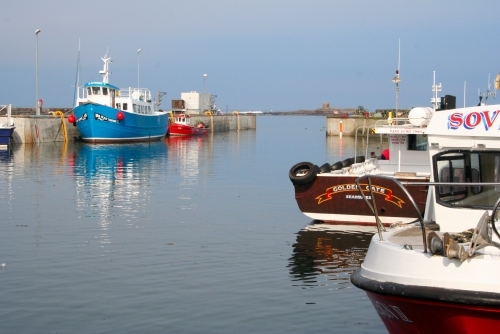 Seahouses is only 1 mile away and has all you need in shops and restaurants etc. Bamburgh is only a mile the other way and the castle is amazing. Alnwick is very near and a must to visit. We even went over to Scotland one day, not far at all! All in all a really great place to stay and would highly recommend it to anyone. We would certainly choose the Cartshed again. All in all avery nice cottage. We found the Cartshed to be spacious and comfortable. The beds were nice and big, the underfloor heating kept us cosy along with the wood burning stove. The cottage was well equiped for pretty much everything you would need. It really is as lovely as the photos suggest. If you like a garden and a view then this isnt the place for you! The outside space is flagged with a fairly high stone wall so you are a little closed in. Although im sure in the summer the owners will put flowering baskets in there to make it more pleasing on the eye. With Stay Northumbria you do have a long list of what they would like you to do on the day of departure!! Pretty much clean the cottage for them really! We would always leave the cottages we stay in clean, but just felt this list to be very strict and unfriendly! Plus if you have pets with you they ask you to clean and then vaccume and mop the floors! Again all fine but when you are paying an excess of £20 per dog (we had two dogs) £40 we shouldnt have to go to such lengths of cleaning as this is surely reflected in the pet excess. We had a fabulous week near the coast in Northumberland. Great spot for bracing walks along the coast with Bamburgh about an hour to the North and Beadnell an hour to the South. With dog friendly hostelries in both locations it's a wonderful place to stay. The cottage is well equipped with everything you need, and more. Lovely and warm due to the excellent underfloor central heating but the log burning fire rounds off the ambience beautifully. We enjoyed our holiday so much we have already booked for a return visit. This has has to have been our third or fourth visit to the Cartshed. We love it, the location, near to but not in a town, a 20 minute walk to the beach, all the equipment and amenities you would expect and need for a holiday in Northumberland. We relax as soon as we arrive, the time passes very quickly and all too soon it's time to go home again. We have been incredibly lucky with the weather, and had clear skies and sunshine all week until friday, but rain or wind would not stop our enjoyment. Our dog loves the dunes and the beach, and he is happy chasing a ball in and out of the sea, or just bunny hopping through the waves. We thoroughly enjoyed our time at the Cartshed, so much so, we've booked to come again. A lovely cottage.Well presented and equipped. Also in a convenient location to visit all the lovely beaches and places of interest that this part of Northumberland has to offer. I chose this cottage because of it's location and it's appearance on the website. It is very convenient for Seahouses and the surrounding areas, with a gorgeous beach at the bottom of the road (about 15 minutes walk) The property has been renovated and finished to a very high standard and has everything you need. All the details throughout the booking process and the extensive information provided in the cottage covered everything you needed to know. We had a stress free relaxing week enjoying walking our dogs in this beautiful part of the country. Would love to return one day. The cartshed was a very comfortable and airy cottage. Very spacious and lovely decor. Everything was clean and tidy and ready for use. Loved the large bedroom with high beams and space. Situated in a great place for a nice walk into seahouses which has plenty of places to eat and few shops. Would recommend this cottage. Gorgeous accommodation a short walk away from Seahouses. The CartShed had everything you could possibly need - the kitchen was the best equipped I have stayed at for a holiday accommodation. The lounge area was lovely with a stunning view across the fields with a lovely little sunny courtyard area. Lovely little touches throughout - a home from home. The local beach a 2 minute drive down the road was fantastic - dogs loved the big open expanse and the rock pools at low tide. A brilliant walk along to Bamburgh Castle and a lovely cream tea at The Copper Kettle. Would recommend this property and would love to go back. For me its like having my own holiday home without the worries of having to maintain and insure it. The location is perfiect for us its an enjoyable walk to the beach of about 20min.There is everything you need in the cottage. Our dog loves it there and its great for us that we can leave the french doors open so he can bask in the sun and watch the world go by, without the worry of him wandering off. We were extremely lucky with the weather all week, but it wouldn't have stopped us even if the weather had been bad. Most of the pubs round about are dog friendly, and there are no dog restrictions on the beach or sand dunes except what responsible dog owners expect anyway. All in all, we had a thoroughly enjoyable and relaxing week. Lovely cottage and very comfortable. Unfortunately I was ill in bed most of the week but the cottage was very comfortable. The house was beautifully furnished and decorated with a lovely kitchen / lounge. The location was ideal and was within easy reach of everything we wanted to visit. The house was very well equipped, and all the little extras like logs for the fire and welcome cakes made it extra special. Excellent cottage with first class facilities, right down to the pint of milk in the fridge for a cuppa on arrival. Ample logs for the burner, underfloor heating was very nice which my two dogs enjoyed. thoroughly enjoyed my stay. The Cartshed exceeded our expectations, the attention to every detail within the house just great. As we were traveling with our aged mother fhe fact everything being on the flat and accessible just fab. The proximity to seahouses only 5-10 mins away, great walking tracks and peace and quiet. We booked this from our home in Australia and the whole experience was seamless. From all our correspondence, booking and paying, it couldn't of been easier. A big thankyou to the team who exceeded in all aspects of great customer service, we will definitely return. An Excellent Break for all three of us. The beach was about 30 minutes walk away, far enough to be well clear of salt spray, but close enough for walking. The beaches and sand dunes in this area are incredible and accessible to all, no real restrictions, other than common sense ones.Having two or three miles of beach to less than half a dozen people was a real pleasure. Bamburgh Village butchers provided the meat for our stay and was excellent. Also the Victoria hotel was "dog Friendly", which meant we could take Rupert with us when we ate out. One of the wonderful features is the number of Pubs in this area that allow dogs in. However, I have usually found that the dogs are better behaved than most kids. beautiful property. fully equipped with everything you will need. central location for exploring Northumberland and the Scottish Borders. 15 minutes walk to beach. The cottage is worthy of it's 5 star rating. Excellent location, walking distance to the beach and Seahouses. Great place to stay with dogs or just for peace and quiet. Felt at home and loved the area, will certainly be recommending to friends and family. Hope to book again soon. We enjoyed a fantastic week in this beautiful cottage, which was everything we could have wished for and more! 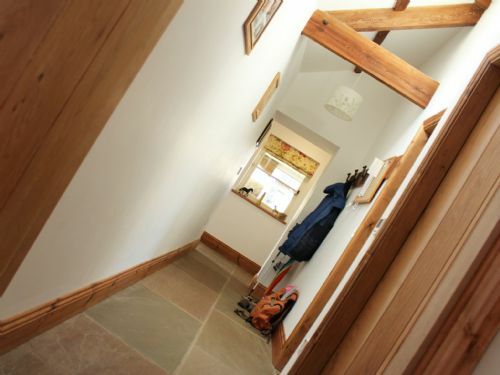 Traditional rustic charm combined with every modern convenience - perfect! The attention to detail was second to none, we particularly appreciated the welcome packs - human and k9! The surrounding area is lovely and within walking distance of the beaches, Seahouses and Bamburgh. 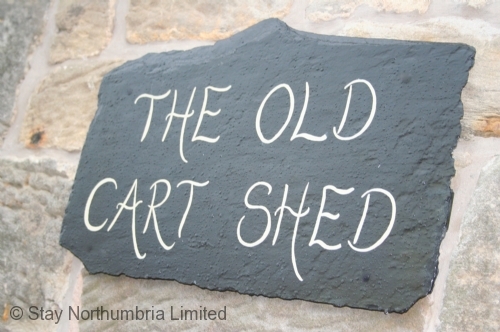 The Cart Shed also provides a good base for attractions a little further afield, we enjoyed a trip to the Farne Islands, Alnwick and the inspiring Victorian house at Cragside. The Cartshed was one of the best cottages we have ever stayed in. The beautiful decoration and attention to detail made this a wonderful stay for our Silver Wedding Anniversary. The welcome pack for us and our two dogs were most appreciated as were the flowers and wine arranged on behalf of my Husband. The cottage was beautifully clean on arrival, with towels, environmentally friendly soaps and cleaning products for our use. We thoroughly enjoyed our stay here and look forward to returning in the future. We had a wonderful stay at the Cartshed and it was equipped and furnished wonderfully. The only thing that did gripe a little bit, was the request to do so much before we left, ie: strip the beds, Hoover etc, I have never been asked to do this when staying at a cottage and certainly wasn't expected to do so especially when paying the somewhat premium rate of nearly £500 pound for 3 nights. Our eldest daughter summed it up perfectly when she said "the only other times I have had to do this was on guide camp and at a youth hostel with school" which I think summed it up perfectly! Other than that a very delightful place to stay. Thank you very much for the positive feed back and we are pleased that you enjoyed your stay and marked this 5* Gold Property with scores to match. We are always hopeful that guests will treat our property with the respect it deserves and leave it as it is found. We are able to offer the continued high standards that we do for that reason, and it does help if it is in a good condition when it is left, so yes we do ask guests if they can aid that process along before they leave. Some do, some don't, but personally I wouldn't dream of leaving a property in which I had stayed, without hoovering, and mopping too as I have a dog, its just a courteous thing to do, don't you think. I too was a girl guide and its really good training for life. The fog came down as we arrived, and did not lift all week. We had one half-decent day during our stay, but not a wink of sunshine. Against this miserable backdrop, we enjoyed our holiday and will return to Northumberland and The Old Carshed to see some of the countryside. It was always a pleasure to return to the warmth and comfort of the cottage each evening. An excellent winter break destination. Underfloor heating plus a small wood burner made it very comfortable for the long winter evenings. 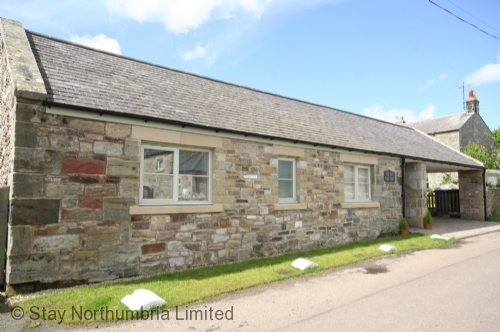 Great location woalking distance from Seahouses and Bamburgh. Very good service from Stay Northumbria. We enjoyed a lovely week at the Old Cartshed. The finish and styling of the cottage was lovely and we immediately felt at home. We are already looking at availability for 2014. Our second visit confirmed what we thought on our first visit - this cottage is an excellent find! 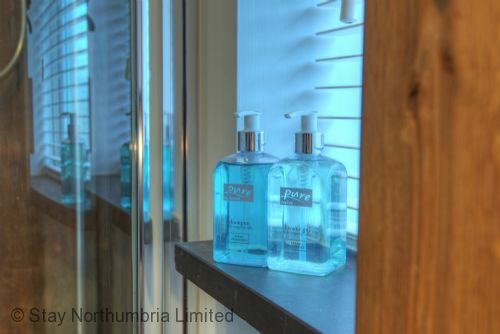 In a perfect location for visiting Northumbria, well maintained and comfortable.